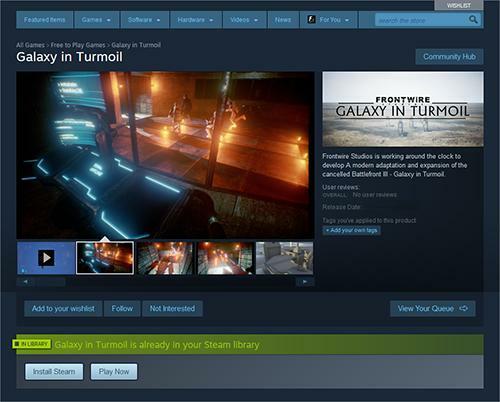 "It is with great pleasure that as of today I am able to officially announce that Frontwire Studios has officially signed a distribution deal with Steam/Valve for the game Galaxy in Turmoil.After ongoing discussion between Valve representatives and myself, Valve/Steam has agreed to ship Galaxy in Turmoil to its millions of users for FREE." "Ill be honest I've had mild concerns myself from time to time.However, Valve clearly lacks that same concern. By agreeing to publish Galaxy in Turmoil, Valve is assisting us in growing and ensuring the longevity of the Galaxy in Turmoil project and community as a whole." By the way Galaxy in Turmoil runs on Unreal Engine 4.